Just did a side by side comparison with chocolate frosting we had for last minute birthday cupcakes. The stats for a 2-tablespoon serving: total calories 130 frosting, 230 jif. Total fat 5g frosting, 14g jif. Sat fat 1.5g frosting, 3.5g jif. Sugars 18g frosting 21g jif. The one downside to the frosting: 2g trans fat. Image | This entry was posted in Nutrition and tagged canned frosting, chocolate, chocolate jif, eat this not that, food, Nutella, nutrition, sweets. Bookmark the permalink. 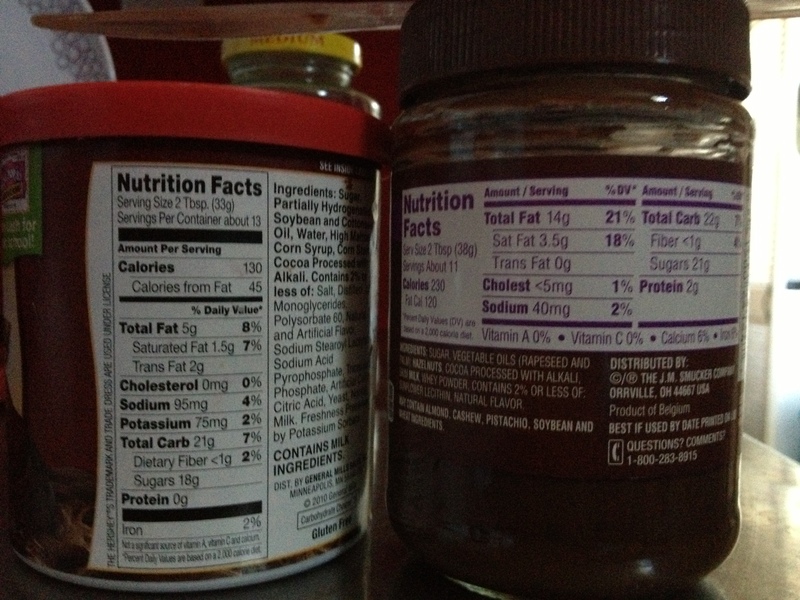 4 Responses to Think chocolate hazelnut spread is healthy? I scoff everytime I see the Nutella commercials….”made with hazelnuts, skim milk, and a hint of cocoa” oh boy…they are trying to make it sound like its a nutritious staple, when really its more of something to use as a treat once in a while…and only 2g of protein? Peanut butter is better than that. But still…it is really delicious and I won’t argue with that! Agreed. For those calorie numbers I would much rather sink my teeth into a fresh chocolate chip cookie – and if it was whole wheat it would even have a little fiber!